Dark Places is a cooperative game based in the mythos of H. P. Lovecraft. Players take on the role of agents of a secret order racing against the clock to reveal the location of a catastrophic event, put into motion by enemies of humanity. If the agents fail to stop the event, a great horror will awaken and cause the destruction of the world and mankind with it. Dark Places is the first game I invented. It grew out of a love for the writing of H. P. Lovecraft, and dissatisfaction with experiences I had with other games of the genre that were either too complex or wouldn’t support single player. My goal was to leverage the tension and mystery in H. P. Lovecraft’s writing style and allow the player’s imagination to become a part of the experience. By leveraging language and narrative over visuals, the game preys on each player’s greatest fear that only he or she can imagine. Dark Places is a cooperative game. It supports 1-4 players, who take on the role of Agents of the Order, Corporis Custodiis that is known as “the body that watches.” Players have a specific number of turns that is counted down by a unique clock mechanism that reveals story events during game play. The clock also determines random events for the players. The game is designed with four different maps, each with seven locations where the major event of the story could take place lending itself to many configurations and variety to encourage re-playablity. During the game the players work cooperatively to complete trials that will give them rewards they can use during the game. 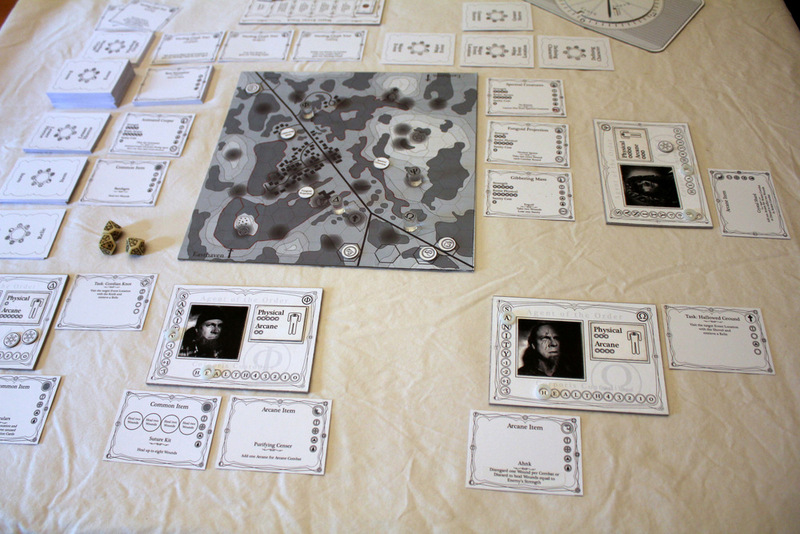 Players move their agents one area each turn around the board, triggering events, gaining helpful items, or facing off against horrible enemies. There are opportunities to perform tasks, to retrieve a powerful relic, which will bear a cost, but in trade will provide an agent with a beneficial reward. Agents may also complete trials to gain warding glyphs which are powerful symbols that may be used to secure areas against enemies, banish them from the game, or assist an agent in completing challenges. The Location of the Major Event will revealed on the clock when it reaches the appointed hour or, agents may reveal this story element before it appears on the clock, by drawing the appropriate Event Card. Once the Location of the Major Event is discovered, players have a limited number of turns to disrupt the activity before the attempt at raising the Great Old One succeeds. If the clock does count down, and the Greater Horror is spawned, the Agents have a desperate race to disrupt or destroy the Major Event Location before the Greater Horror moves off of the board.